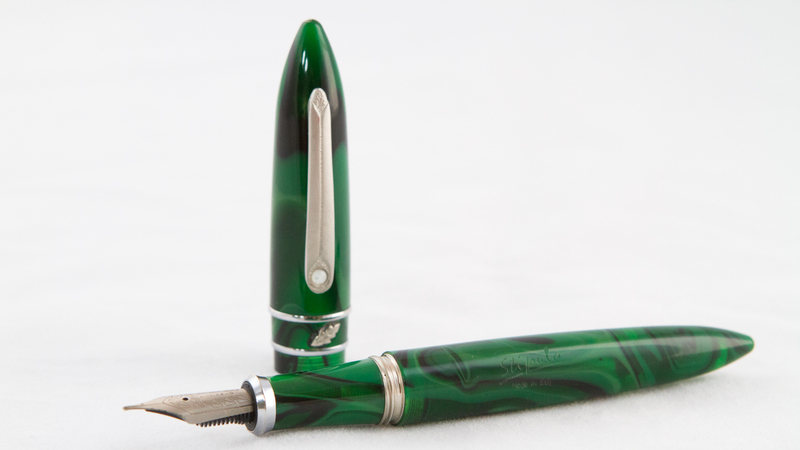 At the beginning of the year, I was fortunate enough to win a wonderful pen from Fahrney’s Pen’s national handwriting month giveaway. 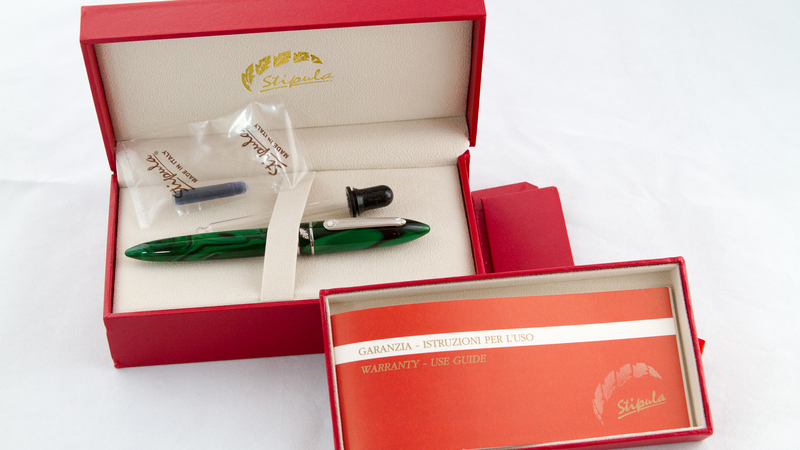 The limited edition Stipula Etruria Rainbow is a beautiful pen, and fits my hand wonderfully. 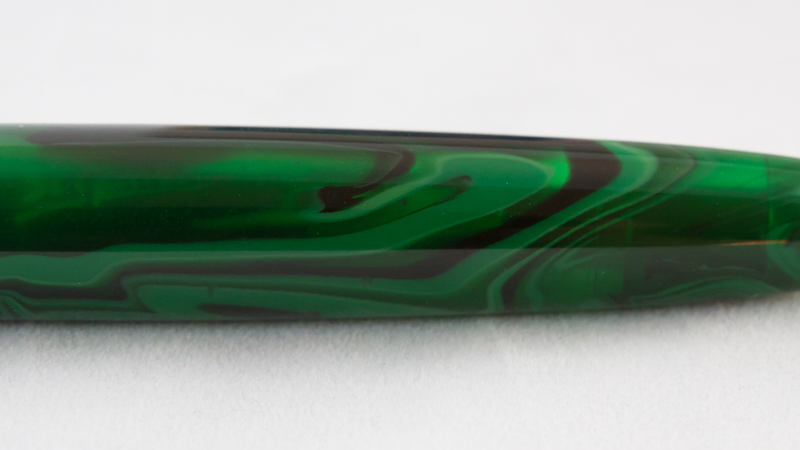 When it came to me the nib had a wicked baby’s bottom problem, but after some work it has become the single most wonderful nib in my collection. 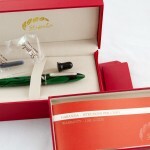 Aside from that one pen, however, I have not had much opportunity to work with Stipula pens. 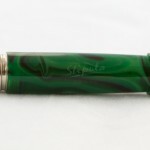 They’re not one of the more common brands here in the states, and once pens reach a certain price point, I generally prefer to handle them in person before buying. But a recent thread on the FPGeeks forum got me thinking about trying out a titanium nib. 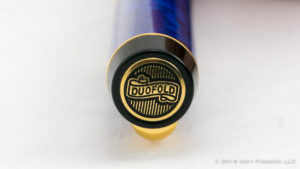 It just happens that Stipula is one of the few manufacturers who utilize titanium rather than (or in addition to) gold for some of their nicer pens. So, between my desire to try a titanium nib and my experience with the wonderful Etruria, I decided to take the plunge. 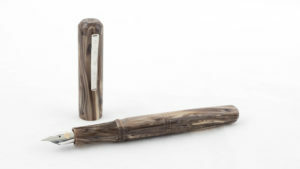 The Stipula Model T is a cigar-shaped pen with pointed ends. 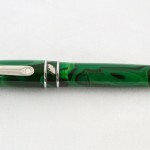 The green malachite resin of my model is deep in color and polished to a mirror sheen. It even has some semi-transparency in certain parts of the swirled material. 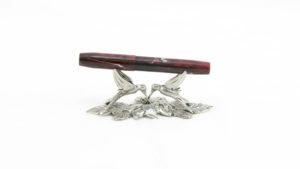 The clip on the pen is, well, odd. 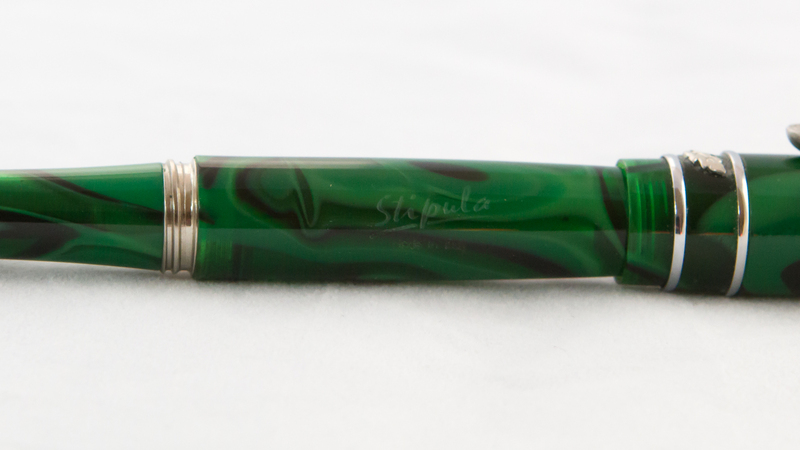 I think Stipula was going for a slightly more organic feel, but the shape is a bit weird, and the pearl at the bottom of the clip doesn’t really fit in with the rest of the aesthetic of the pen. 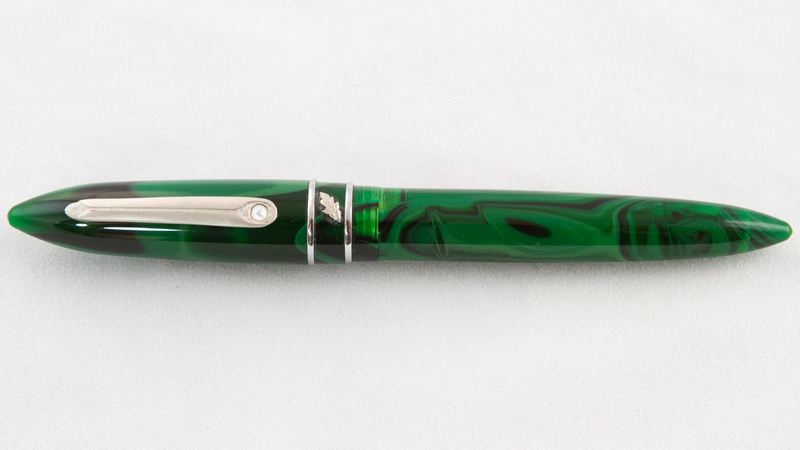 It’s also done in a matte-finished palladium plating, which is kind of nice. 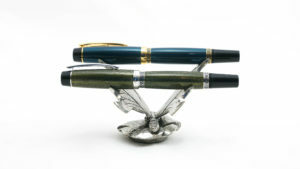 However, the rest of the fittings on the pen, which are also palladium-plated, are done with a shiny finish. The combination just looks a little…off. I wish that Stipula had chosen to stick to one plating method or the other. 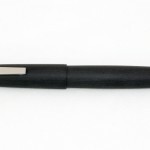 The section, which is made of the same material as the barrel and cap of the pen, screws off to allow access to a standard international converter or cartridge. 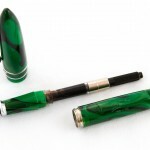 Additionally, this pen comes with a plastic flange and a rubber gasket built into the pen which allows it to be used as an eyedropper, despite the threads of the section are metal. 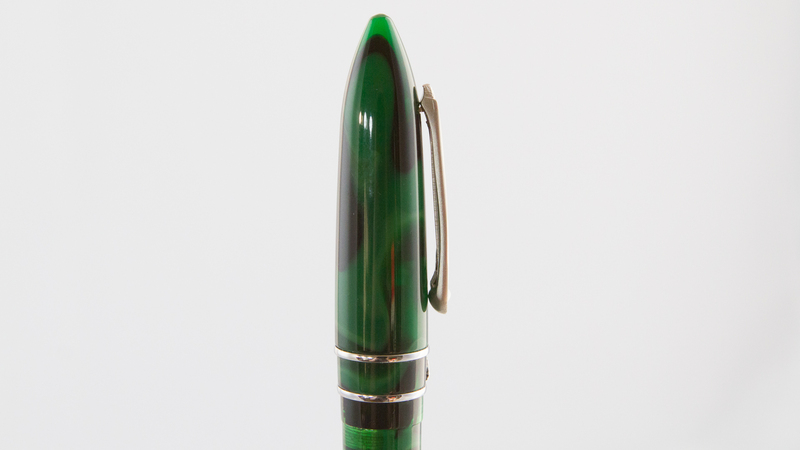 The pen even comes with an eyedropper, which I thought was a nice touch. The flange and gasket make screwing and unscrewing the section from the barrel a right pain, though. Several times, I ended up having to track down a piece of shelf-liner or other grippy material in order to get a decent grip on the highly-polished and slippery resin of the section. 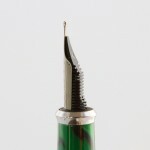 As the cap is unscrewed, Stipla’s T-Flex titanium nib is revealed. 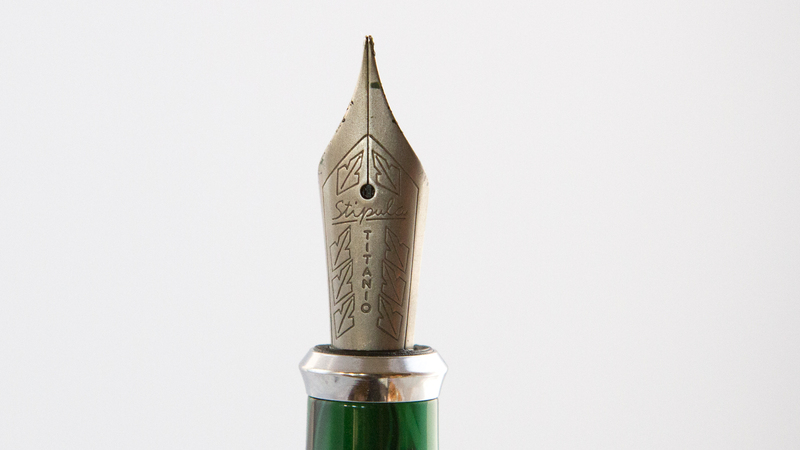 Unlike almost every other nib I’ve seen, the T-Flex has a matte finish. 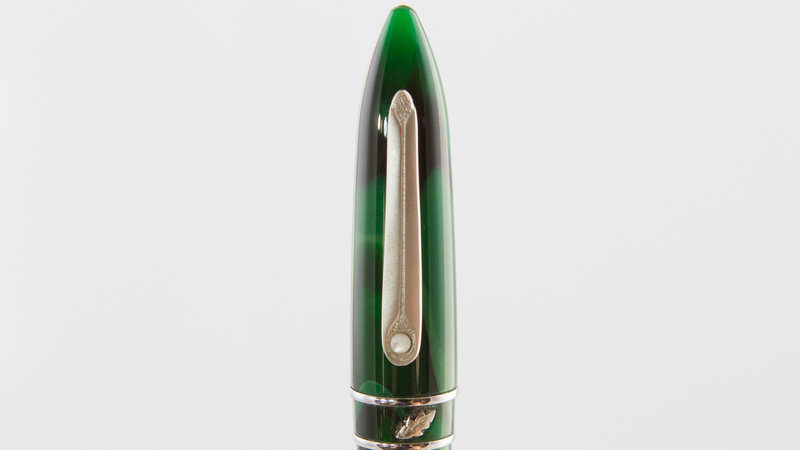 While, initially, I thought it was an interesting look for the nib, over time I’ve come to feel that the unpainted airplane metal grey of the nib looks unfinished and different than the palladium-plated trim that appears elsewhere on the pen. The matte finish on the nib also has the unfortunate side effect of being relatively difficult to wipe clean if you fill your pen by dipping it into the bottle. 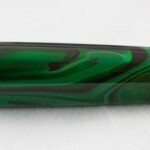 Stipula’s T-Flex nib, which comes in one size only, is said to produce a fine, medium, or broad line based upon the amount of pressure with which you write. 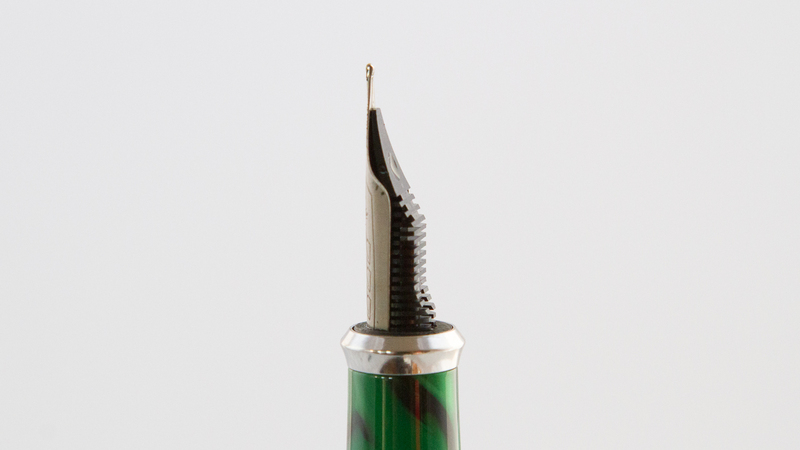 What that really means is that, like a Namiki Falcon, or other modern soft/semi-flex nib, you can get some line variation out of the flexion of the tines of the nib using pressure. 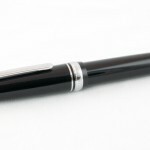 Unless you have a truly magnificent amount of control over the pressure you exert on the nib, however, you’ll not be able to maintain a fine, medium, or broad line over time. In my own experience using light pressure, the pen wrote at a consistent medium width. The nib that came out of the box on my pen was, to be blunt, a train wreck. I could barely get the pen to write at all. The tines were quite out of alignment, and the tip felt as though it had never been polished. 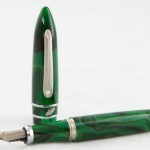 It was a horrible writing experience: one of the worst I’ve ever had on a new pen. I seriously considered sending the pen back and requesting either a refund or a replacement. But, in the end, I decided to use this as an opportunity to practice my nib adjustment techniques on a pen that had some value. Working on titanium nibs is…interesting. Smoothing the point is not big deal, but with a metal that is supposed to flex and return to its original position, it can be a little difficult to get the tines aligned. One thing I should also note with the flex in this T-Flex nib is that, while the nib will flex and return to shape, it can feel rather mushy. 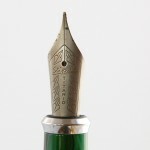 You don’t get the nice snap-back you get from a good gold flex nib, or even some of the steel flex nibs. Despite its name, the T-Flex is not really a flex nib, and if you expect to use it as one, you will be rather disappointed, I think. If you want a little more bounce than normal in your writing, and a bit of extra line variation, this nib is pretty good. Eventually, I was able to get the pen writing fairly well. It’s not anywhere near as smooth as my Etruria. It writes very wetly, especially when “flexing” it. Despite its wetness, though, it sometimes has trouble keeping up with me when pushing the flex of the nib. I got some railroading once I got going a little faster. I am still having some issues with a few hard starts as well, but I think that can be fixed with a bit more adjustment, which I will undertake the next time I fill up the pen. When it comes to extended writing sessions, I find it to be, again, okay. It’s not horrible, and not great. I like the lighter feel of the pen for longer writing, but the grip can get slippery, and the shape of the section isn’t the most ergonomic. Of course, my experience may be a bit skewed by my natural reaction to death-grip the pen when it starts hard-starting or skipping. I suspect that, once the hard-start issue is resolved, I should be able to relax a bit and the pen will begin to feel more comfortable. 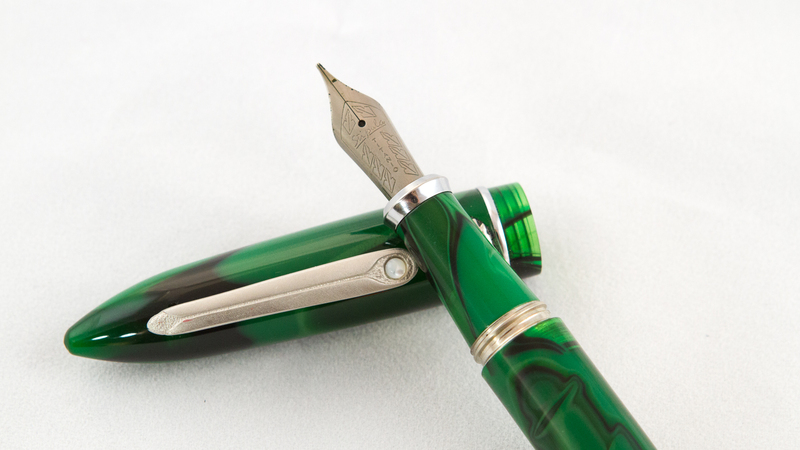 As for Stipula pens, though, as the old saying goes: “Once is a fluke, twice is a trend, three times is a habit.” When it comes to nib issues, I’ve now seen a trend. 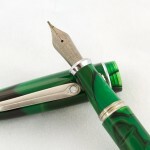 I like some of the Stipula materials, but the fact that two of the two Stipula pens I’ve tried have needed significant work indicates to me that Stipula has a trend of putting out nibs that have the potential of being great, but that they haven’t taken the time or effort to ensure are great before releasing. There appears to be a bit of a systemic issue with their quality control. (Either that, or I’ve just been extremely unlucky.) 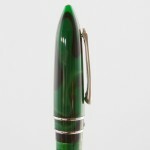 Despite that, I love my Etruria so much, I would still like to get one with a different material. 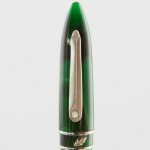 I’m going to skip the T-Flex nibs going forward, though, and stick to the 14k or 18k gold nibs. I’m also going to be prepared to have to adjust it or send it out for adjustment before it becomes a great writer. 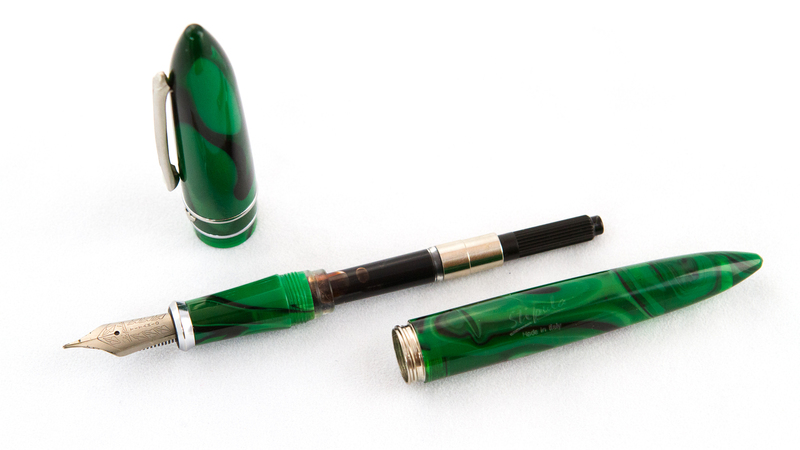 It’s unfortunate; with such beautifully made pens, Stipula really ought to catch problems like these before they leave the factory.